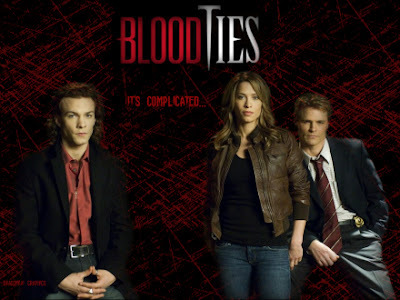 Vampire Beauties: The Vampiress Episode:"Blood Ties"
Blood ties is a Canadian crime drama which aired on the Lifetime network in 2007. The story followed a former police officer named Vicki Nelson. Vicki left the police force as her eyesight began to fail her due to a medical condition. Instead of just quitting altogether she decided to become a private investigator. During a case in which people were being found dead with their blood drained she meets and befriends a vampire named Henry Fitzroy who helps her solve the case (it ended up being a demon and not a vampire). From then on they worked together to solve cases (most of which were supernatural in nature) while fighting their own feelings for each other. In this episode models are being found dead via being completely drained of their blood with various clues pointing to the vampire culprit being a woman named Christina who is connected to the women as the photographer assigned to work with them. Christina also happens to be the woman who turned Henry into a vampire in the first place. Eventually we find out that Christina turned a young male model from Montreal into a vampire and he resented her for it resulting in him trying to ruin Christina's life. Though Christina was a victim in this episode, outside of the whole stalker issue she was not innocent at all. Stories are told of her once attempting to kill Henry in the past are mentioned in this episode and she is VERY threatened by Henry's feelings for Vicki which she had no problem going to Vicki and letting her know at all. Her and True Bloods Lorena could have a lot to relate to each other about (had Lorena not been killed of course).